No, it’s not a typo (I don’t mean black Aces and Eights, Wild Bill Hickock’s “dead man’s hand”;) this relates to Noah Webster, Henry ʻŌpūkahaʻia, and Hawaiian grammar and spelling. How in the world are these in common? … Let’s look. Noah Webster (1758-1843) was the man of words in early 19th-century America. He compiled a dictionary which became the standard for American English; he also compiled The American Spelling Book, which was the basic textbook for young readers in early 19th-century America. ʻŌpūkahaʻia, in 1809, boarded a sailing ship anchored in Kealakekua Bay and sailed to the continent. ʻŌpūkahaʻia latched upon the Christian religion, converted to Christianity in 1815 and studied at the Foreign Mission School in Cornwall, Connecticut (founded in 1817) – he wanted to become a missionary and teach the Christian faith to people back home in Hawaiʻi. A story of his life was written (“Memoirs of Henry Obookiah” (the spelling of his name prior to establishment of the formal Hawaiian alphabet, based on its sound.)) This book was put together by Edwin Dwight (after ʻŌpūkahaʻia died.) It was an edited collection of ʻŌpūkahaʻia’s letters and journals/diaries. This book inspired the New England missionaries to volunteer to carry his message to the Sandwich Islands. OK, so what about the 3s and 8s – and Hawaiian grammar and spelling? It turns out that a manuscript was found among Queen Emma’s private papers (titled, “A Short Elementary Grammar of the Owhihe Language;”) a note written on the manuscript said, “Believed to be Obookiah’s grammar”. 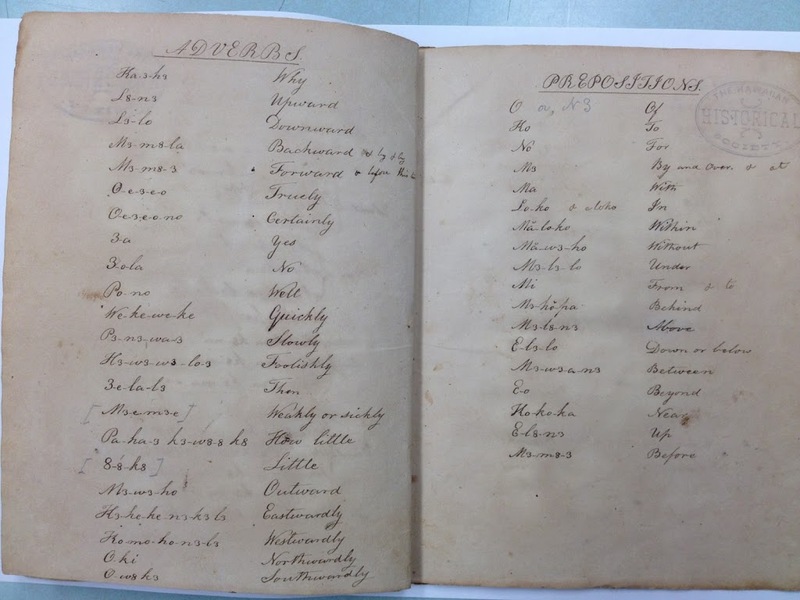 Some believe this manuscript is the first grammar book on the Hawaiian language. However, when reading the document, many of the words are not recognizable. Here’s a sampling of a few of the words: 3-o-le; k3-n3-k3; l8-n3 and; 8-8-k8. No these aren’t typos, either. … Let’s look a little closer. So, where does Noah Webster fit into this picture? As initially noted, Webster’s works were the standard for American English. References to his “Spelling” book appear in the accounts by folks at the New England mission school. As you know, English letters have different sounds for the same letter. For instance, the letter “a” has a different sound when used in words like: late, hall and father. The following is a chart for some of the letters related to the numbers assigned, depending on the sound they represent. The image shows a page from ʻŌpūkahaʻia’s Grammar Book. In addition, I have included other related images in a folder of like name in the Photos section on my Facebook and Google+ pages.